A social media takeover puts your organization’s account in the hands of another for a set period of time. As these events allow the creativity of the guest host to shine, they can take shape in several different ways. Even though no two takeovers look exactly alike, you can set ground rules to ensure your social media event accomplishes specific goals. Perhaps you want to engage a new audience, build brand awareness, or simply delight your current followers and strengthen relationships. To give you a better idea of what these takeovers can look like, we gathered four successful examples across different social media platforms. From a celebrity to a band to a school to an entire company, the possible entities that could host a takeover are endless. Dig into the examples below and use them for inspiration to design your own takeover that provides an engaging, fun, and inimitable experience. It’s safe to say that both Retta and her TV character has become a modern cultural icon. So, when the Los Angeles Kings NHL team asked her to live tweet one of their games, the fans went nuts. The director of digital media for the Kings laid down a big bet with this strategy. After all, Retta knew next to nothing about hockey at the time of the request. However, the Kings were banking on the fact that her influence, fame, and popularity would bring in entirely new crowds of people to support the team. 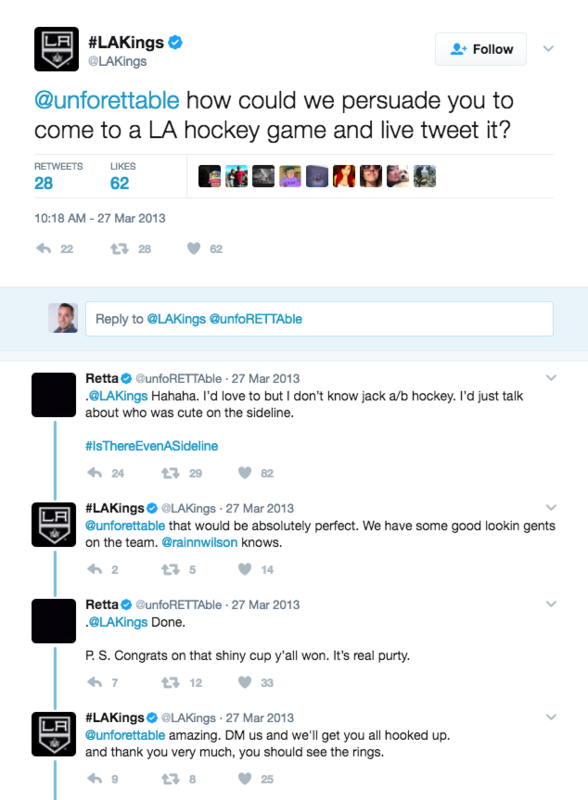 The initial ask from the LA Kings for Retta to live tweet the game. 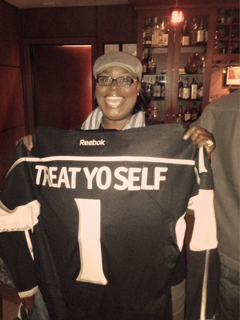 Retta was more than happy to oblige, and, as her live tweet experience shows, she had an amazing time at the game. Not only that, she turned around and wrote a blog post about how she’s a Kings fan for life. The Kings gave her a custom jersey too! While Retta’s live tweeting is an interpretation of a traditional social media takeover, it is an effective strategy to consider. Though she didn’t take direct control of the LA Kings’ Twitter stream, she heavily leveraged her own social media influence to get people excited. The result was a network of people who engaged directly with her tweets and paid more attention to the Kings. It’s a shining example of how you can use others’ influence to build your brand. Currently, Retta still goes to the games and live tweets for her fans. Their initial outreach has since turned into an ongoing relationship that benefits their organization. Wooly’s is a relatively small music venue in the relatively small city of Des Moines, Iowa. However, their Instagram account has 7,535 followers and is steadily growing. They’re able to attract some pretty big names in the music industry like Boombox, Tromboneshorty, and Rebelution. Part of Wooly’s success comes from the fact that they heavily promote bands playing their venue on social media. But they also let a lot of these bands take control of their Instagram account. On the day of the show, takeover bands showcase the fun things they do to get ready, where you can meet up with them, and glimpses backstage. Our friend @nickvanberkum has crafted a super special limited edition poster for @themaytags show tonight. Nick does awesome work for bands like Wilco and Conner Oberst and we feel pretty blessed that he shared his talents with us for the gig! Notice that, in almost all of the posts, The Maytags put the relevant details for the event taking place that night. In this context, it’s crucial for Wooly’s to define that they need The Maytags to do that. This is the balanced duality of defined objectives mixed with creativity. If The Maytags failed to ever say they were playing Wooly’s later that day, people would be left confused as to why they were posting on the Wooly’s Instagram account. Executed properly, it’s a great way to get people excited for their shows while also engaging directly with fans and potential new audiences through the social media account. Snapchat captures about 40 percent of people aged 18 to 34. It’s quick, easy to use, and turns out heavily digestible content. 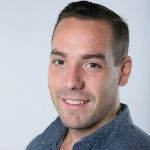 Given its reach in younger demographics, several universities leverage this channel to engage their unique mix of audience members. They offer their current students an opportunity to take over their Snapchat account as a way to keep other students, prospective students, alumni, community members, and other universities in the loop. For example, the University of Cincinnati uses them to excite potential new students, give current students a sense of pride, and directly interact with alumni. Snapchat stories disappear after 24 hours! Be sure to save your story throughout the day on this channel if you hope to use this content again at a later date. 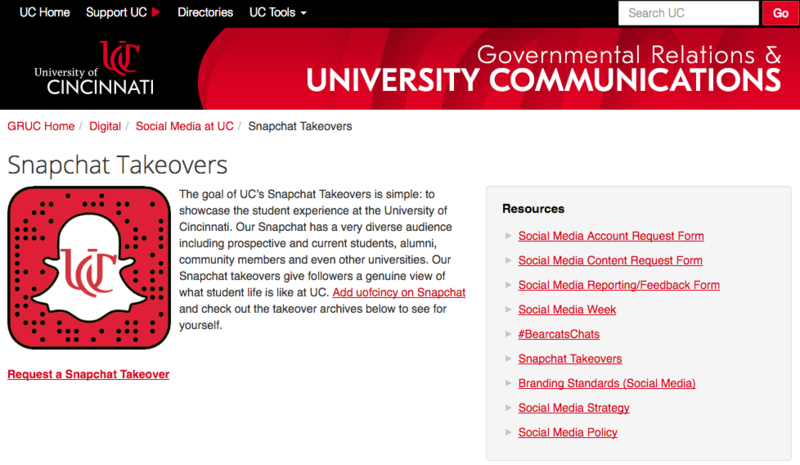 Most universities will keep an archive or catalogue of Snapchat takeovers and publish them to YouTube to reap even further rewards from the experience. In 2016, Red Bull hosted an event called the Cold Rush that featured snow sports athletes. The North Face Canada had a some of their sponsored athletes participating, and wanted to ensure that they captured every detail of the activities. Knowing that their hands would be full during the event, The North Face asked a design firm, Origin Design, to cover the entirety of the event for them. The directive was clear cut. Through a social media takeover, Origin Design would help them reach new audiences, document the point of view of The North Face’s athletes in the event, and renew the interest of their social communities. To show off the high quality photos they captured, Origin took full advantage of The North Face’s Facebook page. They also used it to deliver weather updates with images for all the fans and athletes at the event. While Facebook offered a great platform to provide these high quality photos, The North Face didn’t restrict Origin’s access to Facebook. Instead, they gave Origin full control over all of their social media channels—Instagram, Snapchat, Twitter, and Facebook. This full-style takeover isn’t the most common option, but it’s effective and could bring you major engagement. Creativity is central to the success of any social media takeover, so don’t be afraid to take a step outside of your comfort zone. That’s how you get celebrities like Retta live tweeting your game, bands doing flash mobs to promote your venue, students showing what unique lifestyles thrive on campus, and design firms to take an already successful event to it’s maximum. All of these examples can also be applied to your nonprofit just as successfully. What unites all four of these examples together is that the guest hosts are passionate about the organization they’re working with. Regardless of your budget or connections, what matters is that you invite people with a passion for your nonprofit and its mission. The rest will take care of itself.